Evolve Money just sent out an email with some big changes that are likely going to adjust your manufacture spend strategy using the program. If you’ve been taking advantage of Evolve Money to earn extra miles and points to pay your mortgage the new changes are for the worse. Big changes to Evolve Money: limit of one payment per biller a month. 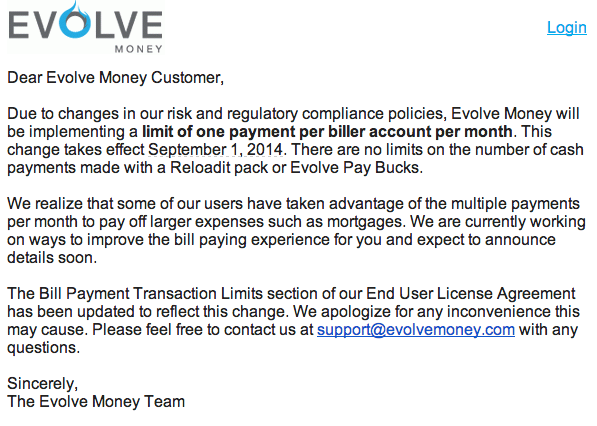 Starting September 1, 2014 Evolve Money users will be limited to sending one payment per biller account every month. In the past Evolve Money has allowed folks to make multiple payments to their mortgages using Visa and Mastercard gift cards. Now you will only be allowed to send one payment to each individual biller account per month and no longer be able to make big payments (AKA big manufacture spend). This means that if your payment exceeds the amount you can fit onto one gift card, you will not be able to fulfill the entire payment for that month. This will affect you if you have been using Evolve to make multiple monthly payments to pay your mortgage or other large bills. Using Evolve Money for payments to auto loans and student loans should be largely be unaffected because most people have less than $500 due per month on each. We realize that some of our users have taken advantage of the multiple payments per month to pay off larger expenses such as mortgages. We are currently working on ways to improve the bill paying experience for you and expect to announce details soon. The Bill Payment Transaction Limits section of our End User License Agreement has been updated to reflect this change. We apologize for any inconvenience this may cause. Please feel free to contact us at support@evolvemoney.com with any questions. The bottom line is that making larger payments using multiple gift cards will no longer be possible through Evolve Money. Beginning September 1, 2014 you will limited to sending one payment per month to a biller account. For anyone that has been using gift cards to make potentially big payments to their mortgage this will be a huge hit to their manufacture spend strategy.